Debajo Del Sombrero is a platform for the creation, research, production and dissemination of art where its main protagonists are people with intellectual disabilities. Their workshops are developed in spaces that enable learning and dialogue with other artists, as well as the realization of both individual and collective projects. Cai Tomos is a Welsh dance artist whose work revolves around finding ways in which to explore the stories of the body. His practice has emerged from a broad understanding of ‘listening’ as central to his investigations with others. This methodology has been central to the success of a variety of international projects with diverse groups of all ages, backgrounds and abilities. SOME THINGS, FROM SOMEWHERE began in March 2017 as a meeting point between Cai and six of the artists from Debajo Del Sombrero. The invitation from Cai was to base their shared creative research on the body, its movement and its expression. Working together for one week at a time in Naves Matadero, Cai and the artists have embarked on a fascinating and richly rewarding creative journey which highlights the relationship between time, honesty and the necessity of waiting. 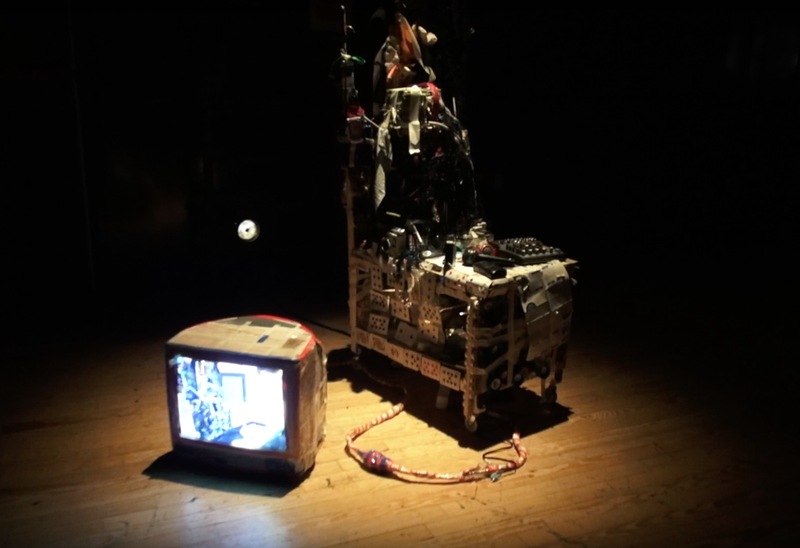 The journey has been continuously documented through videos, photos, audio recordings, objects and written chronicles which have inspired this installation. I joined the project for the final four months to make some films and curate and design the exhibition.